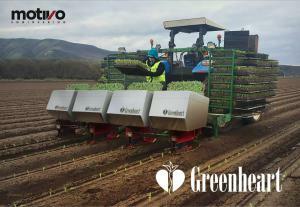 GARDENA, CALIFORNIA, UNITED STATES, April 2, 2019 /EINPresswire.com/ -- After a successful showing at the 2019 World Ag Expo in Tulare, California, Motivo Engineering shipped their first automated vegetable seedling transplanting hardware unit directly to Greenheart Farms in Arroyo Grande, California. “The response from farmers at World Ag Expo was exceptional, but now the real fun begins when we work directly with Greenheart Farms in the field to fine tune our latest Ag-Tech product for ultimate speed and performance.” says Praveen Penmetsa, CEO Motivo Engineering. The Motivo Greenheart automated vegetable seedling transplanting process addresses several critical issues for todays’ farmers. •	Capable of planting speeds in excess of two plants per second. •	The single machine per line design allows for flexibility for multiple bed configurations, and single line serviceability. •	There are fewer moving parts when compared to other automated transplanters, with fast modular part replacements. •	The efficient design makes for a unit that is compact in size, and lightweight. It shares a foot-print that is similar to the existing manual transplanters. •	It mounts directly to industry standard tool bars. •	It accommodates small bed line spacing. Motivo has been working behind the scenes on agricultural projects for many years before going public at the 2018 World Ag Expo with their HARVEST tractor, a Motivo concept that was developed and deployed for testing through a Powering Agriculture Grant from USAID. Motivo was recently awarded a patent for HARVEST, for a vehicle in the form of a tractor that features a Mobile Power Conversion and Distribution System. Motivo will be doing public demos at the Forbes Ag Summit on June 26-27 in Salinas, California and discussing how collaborative engineering with the right partners can accelerate progress for agriculture. Motivo Engineering in an innovation engineering firm headquartered in California, USA. Motivo has helped clients develop and globally deploy technologies ranging from driverless cars to automated planting robots. Motivo’s unique innovation framework has reduced the risks in transformative product development for clients ranging from early stage start-ups to global conglomerates in the mobility, ag-tech and aerospace market segments.